Thousands of people are expected to visit the relics of St. Anthony when they are brought to Ireland, Knock shrine, and the UK this June. 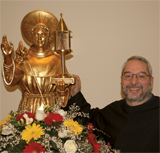 First Class relics of St. Anthony from St. Anthony’s Basilica in Padua, Italy, where his tomb is located, will be taken to churches in Ireland, Scotland, and England for veneration. At each church the relics will remain exposed during special Masses, at the conclusion of which all those attending will be invited to approach the reliquary for a blessing. See below for tour schedule. Veneration continues up to 1pm.